Soviet and British spy Kim Philby. Source: Archive Photo: Rufina Philby, the Russian wife of the spy. Retired KGB general pens fond memoir of the man, not the spy. Bulgarian intelligence veteran Todor Boyadjiev spent his working life in the world of cloak and dagger, rising to become a general in the Soviet KGB. A close associate of notorious British spy Kim Philby, who defected to the Soviet Union in 1963 and died in Moscow in 1988, Boyadjiev has published his account with Yekaterinburg publishing house Sokrat of one of the highest-ranking double agents of the Cold War, The Spy. 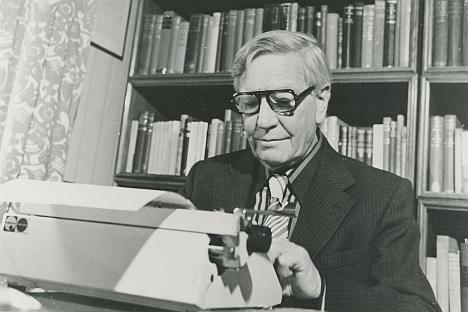 Kim Philby. The Man. Philby, who worked for both the British secret service MI6 and earlier covered the Spanish Civil War from the pro-Franco side for The Times, managed to pass thousands of documents to the Soviet leadership and to prevent the disclosure and elimination of many agents. A member of the so-called 'Cambridge Five' that included art historian Anthony Blunt who was exposed as a spy only late in his life in 1979, Philby has been the subject of more than 200 books and many movies. Born in India in 1912, the son of a British member of the Indian Civil Service, Philby chose to work for Soviet intelligence when he was still young, and after he defected admitted he had never regretted the decision. He was one of the most successful spies ever whose career spanned 30 years. Boyadjiev spent those 30 years in the Bulgarian intelligence service, rising to become its deputy head. A prolific writer on intelligence work, the Philby study is his third full-length book. When Philby died in 1988 London auctioneers Sotheby's put up Philby's belongings for sale, Boyadjiev recalls. Agents for the auction house approached him and offered a large sum for his collection of personal correspondence – a few dozen letters and more than 300 photographic negatives, but Boyadjiev refused. It is these documents, as well as interviews with Philby's students, chiefs and associates that form the basis of the book. Boyadjiev knew Philby personally and maintained friendly relations with him during the last 15 years of the spy's life -- from 1973 to 1988. They met when Todor was only 33, and his older colleague was already 61. Philby went to Bulgaria on holiday and stayed for six weeks. The entire second part of the book is devoted to Philby's travels to Bulgaria, which Boyadjiev claims have never before been published and is unknown to the wider public. It emerges from the book that if not for a special operation involving a doctor from Bulgaria, the 'Cambridge Five' could have been exposed as early as 1945 and Philby's fate would have been very different. Stanislav Roshchin, who was in charge of communication between Philby and his controllers during the British spy's early years in Moscow, told Boyadjiev that Philby was interested in the fate of Volkov. On his request, Roshchin requested archive materials and to his surprise found that Volkov was not shot as a traitor, but sentenced to 10 years in prison. The book also contains a transcript of Philby's meeting with the Bulgarian Interior Ministry's deputy ministers and chiefs of operations (made during Philby's first visit to Bulgaria in 1973). Boyadjiev helped Philby to prepare reports and was the interpreter during the meeting. Speaking about Philby's character, Boyadjiev notes that the spy did not like being guarded and invented various ruses to shake off those detailed to protect him. At times he would send his guard to book a restaurant table or buy a newspaper. Boyadjiev recalls that staying alone with him, Philby was often candid and shared thoughts that would have "infuriated our bosses." Boyadjiev insists the book is not truly a memoir, as he has had a lot of co-authors. "There's been a lot written about Kim Philby the spy, but much less about him as a person. Two-thirds of my work is about the person," Boyadjiev says.